Is maybe the destination IP address chunk of one of the local subnets that this router has on one of his interfaces? If that is true, packet will be forwarded using the Layer 2 described in the question No2 below. If that is not the case, Router needs to make a route lookup on his routing table in order to find the longest match for this IP address subnet. Each routing table entry has the destination subnet defined together with next-hop IP address which needs to be used in order to forward the packet to that destination network. Router makes that routing table lookup in order to decide out on which interface (towards which next-hop address) he will need to forward the packet so that IP destination can be reached. Device then looks at his local ARP table. Does it include a MAC address associated with the destination IP address? If there is no ARP table entry for that IP address it will need to broadcast an ARP request to get this destination IP host response with his MAC address. Routing recursion is a recursive search process of routers routing table where the next-hop IP address is wanted to route packed towards its destination but when found it is not part of any directly connected network. Usually, Router checks the destination address inside packets IP header and makes the decision based of few steps described in the routing example above. When router finds longest match route for wanted destination, the next-hop value for this prefix is read and checked. If that longest match next-hop IP address value is a connected route then outgoing interface is known and layer 2 address is found which enables the frame to be built and transition of the packet can be done towards the destination. If the next-hop that IP does not exist on any of the ends of connected interfaces, additional routing lookups must be done for an outgoing interface to be found. This additional routing table lookups are known as recursive lookups. That next hop IP 10.10.1.2 is then found as a part of directly connected subnet 10.10.1.0/24 through exit interface FastEthernet0/0. 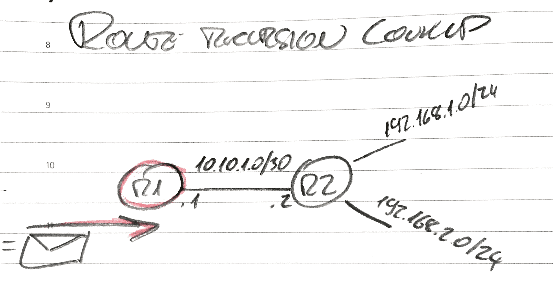 Process used by router R1 in the example above is called recursive lookup because router needed to go across the routing table twice in order to find the out interface. When a route table entry shows next-hop IP address and not a directly connected exit interface, recursive lookup is needed. Therefore another lookup has to be made. There can be more lookups, until the route with exit interface specified is found. Please comment if you have any info regarding this case. Thanks to Dmitry I took some time and corrected several unintentional errors and outdated parts of the articles that were not relevant in network devices today. Unintentional was the part with “This additional routing table lookup process is known as recursive lookup”. It is true, Recursive means keep looking until you find next-hop and outgoing interface or drop the packet, so it is correct to say: “This additional routing table lookups are known as recursive lookups.” taking into account more of them if more of them are needed not only the first additional lookup. Also, giving the example at the beginning about Routing decision on end devices did not state clearly that is an example for a device connected to Ethernet network. I made that clear now. Outdated part was my last tip at the end of the article saying that “It is always better in order to get the best routing performance that every route table entry is defined with outgoing Interface and not next-hop address”. I’m silly, we have route-cache mechanisms like Cisco CEF in our network devices which enable us to skip routing table lookup every time same destination is needed. This TIP is about network devices older than me. I removed that last paragraph. The reasons why it does not matter is explained in this one: How can router decide so fast? Thanks for the article, but there several things that are not exactly true. “Device then looks at his local ARP table. It is assumed that the media between two routers is always Ethernet what in many cases is not true. No, it’s always called recursive lookup. Recursive means keep looking until you find next-hop and outgoing interface or drop the packet. No. It does not add any routing performance. CEF will recalculate outgoing interface/next-hop anyways. No, the first example that comes to my mind is BGP. Just wanted to let you know that I corrected the article after you drew my attention to some errors inside.